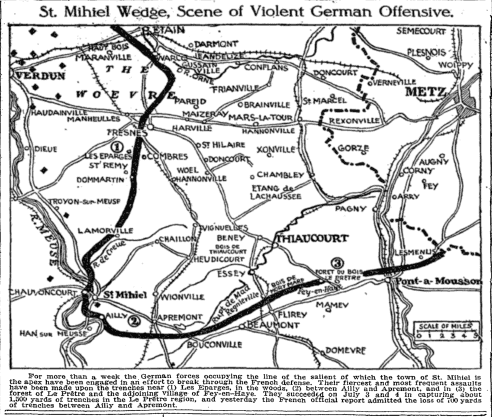 French aerial squadron bombard and destroy German stores at Vigneulles in the St. Mihiel wedge, and throw bombs at Libercourt between Douai and Lille. Crown Prince captures portion of the French line at Vienne le Chateau in the Argonne, but is finally repulsed. Mr. McKenna announced in the House of Commons that £570,000,000 had been subscribed to the War Loan. Government proclamation under the Munitions Act making it an offence to take part in a strike or lock-out applied to South Wales. British First Army attack the enemy’s lines between the Bois Grenier and Festubert and gain the ground south-east towards Fromelles. Fighting in this area continues. British airmen attack St. André Railway Junction, north of Lille, and the canal bridge at Don.